Development of industrial sector owing to setting up and expansion of Social Economic Zones such as Tanjung Api-Api, Bitung and Morotai and also with the redevelopment of infrastructure would fuel the growth of Indonesia Diesel Genset market over the coming years. Additionally, development of IT & telecom sector and rising number of small and medium-sized businesses would also spur the demand for Diesel Gensets in the country. According to 6Wresearch, Indonesia High Speed Diesel Genset Market Size is projected to grow at a CAGR of 3.8% during 2018-24. In Indonesia, high speed diesel gensets with rating 5 kVA-500 kVA accounted for majority of the revenue and volume share in the overall Indonesia high speed diesel genset market share due to wide range of applications across various sectors. high utilization of these gensets in telecom infrastructure in the unreliable and off-grid regions is also expected to drive the market by 2024. By Application types, commercial application accounted for majority of the revenue share in the overall market, followed by industrial and residential applications. However, during the forecast period, the industrial application is expected to depict highest growth rate due to the development of large-scale industrial projects such as construction of new special zones in Bitung and Morotai, which would be responsible for the growth of high speed diesel genset market over the coming years. By regions, Java region captured the largest revenue share followed by Sumatra region and is anticipated to maintain its dominance over the coming years due to upcoming industrial parks in East, Central and West Java region, which would require installation of new high-speed diesel gensets in the region. The Indonesia High Speed Diesel Genset Market Report thoroughly covers Indonesia High Speed Diesel Genset market by kVA rating, types, applications and regions. The Indonesia High Speed Diesel Genset Market Outlook report provides an unbiased and detailed analysis of the Indonesia High Speed Diesel Genset Market trends, opportunities, high growth areas and market drivers which would help the stakeholders to device and align their market strategies according to the current and future market dynamics. • Historic data of Indonesia High Speed Diesel Genset Market Revenues and Volume 2014-2017. • Market Size & Forecast of Indonesia High Speed Diesel Genset Market Revenues & Volume until 2024. • Historic data of Indonesia 5 kVA-500 kVA High Speed Diesel Genset Market Revenues & Volume 2014-2017. Revenues & Volume until 2024. • Historic data of Indonesia 501 kVA-1000 kVA High Speed Diesel Genset Market Revenues & Volume 2014-2017. • Historic data of Indonesia 1001 kVA - 3000 kVA High Speed Diesel Genset Market Revenues & Volume 2014-2017. • Historical data and Forecast of Indonesia High Speed Diesel Genset Market Revenues & Volume, By Types. • Historical data and Forecast of Indonesia High Speed Diesel Genset Market Revenues, By Applications. • Historical data and Forecast of Indonesia High Speed Diesel Genset Market Revenues, By Regions. • Indonesia High Speed Diesel Genset Market Trends and Developments. • Indonesia High Speed Diesel Genset Market Share by Players Competitive Landscape. 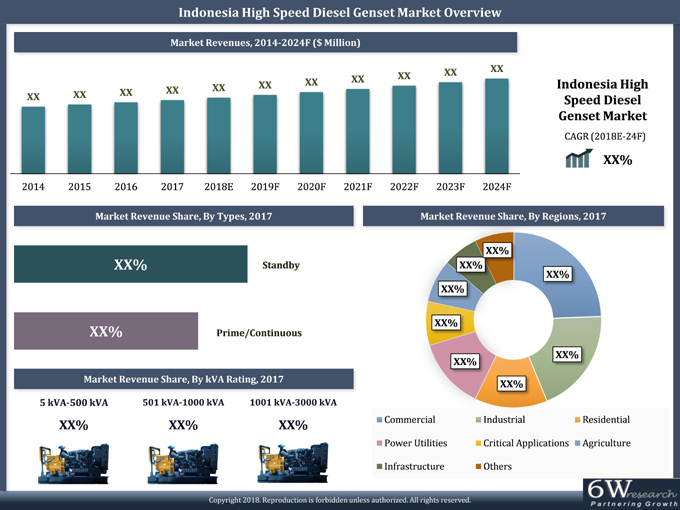 • Indonesia High Speed Diesel Genset Market Overview on Competitive Landscape. 14.7 Deutz Asia-pacific (Pte.) Ltd.